Well, what a day! 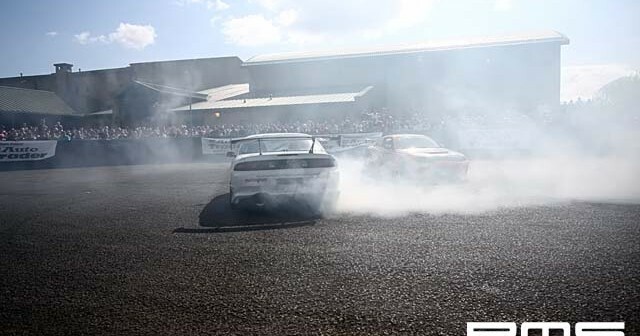 After problems, problems and erm, more problems Coopers 200sx drift car finally made it to fintona for the first demo, Andy and myself went out and just over 1 circle later she cut out. Quick inspection showed the AFM plug loose, fixed it, then replaced a jubilee clip on other piping that was loose. Still wouldn’t run, Richard Bradley aka "Dr. Datsun" tried everything he knew of, once he arrived with new coils and plugs and still wouldn’t run right. For the last run it was decided it must be an air leak! So removed BOV and replaced the hole with the handle of screw driver and clamped it down good and tight, HEY PRESTO, Andy "smokin" Cooper went out and destroyed his brand new 18’s in 1 session blowing one up in the middle of a 3 way drift with Terry Grant and The Brand to show his annoyance at what turned out to be a silly leaking valve. Terry Grant was there with some new displays and acts and what a noise out of that TVR, on the last session he managed to pop the Yamaha engine in the wee special kit car to huge cheers, then he got very annoyed and went clean mad in the TVR to the crowds delight, he put on a great show and is a real crowd pleaser. 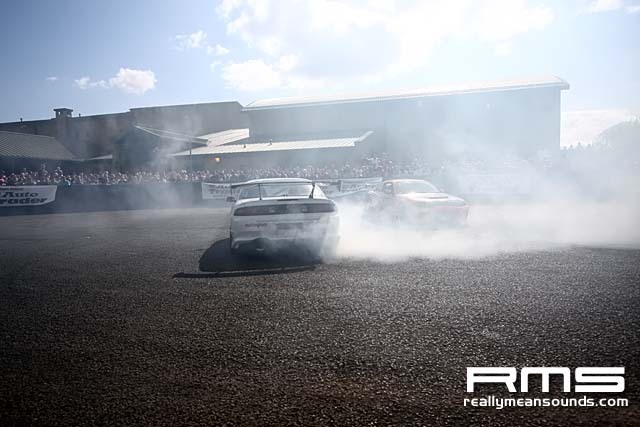 Buff Sideways Luney, was just started his last demo run in Declan Hicks’ Soarer an intercooler pipe blew off and in the process burst a hole into the radiator ending his day, but what a smoke machine that supra engined beast is. Brandy of Steer from the Rear had his s15 Silvia down and was his usual wreckless self popping tyres all day and getting the crowd going with the anti lag system banging also, he assured me the car is nowhere near complete and has yet to see a lot more shetlands and some more cosmetic work inside and out eventually, watch this space. Inside the hall it was very warm and full of petrol fumes but some fresh cars to the scene were on hand so was worth a few laps i feel seeing what was about! Hinman Media had the two modified cars there that have been built for a show to be aired on BBC and the vote went to the Larne Team in a kitted and ice’d 106, while the Bangor team were gutted after building a complete custom, one off, caligra pick up. Well done to both teams as 17 weeks and £5k isn’t really a lot of time to build what they managed. A few other cars to note was the Yellow Evo, white and black Astra, K1DD’s uber cool Clio with matching trousers. A mention must also go to young Conor McCann in his euro’d semi rat look polo who brought some aerosol and stencils and made a lovely little old skool pacman on his rear bumper for the camera. The talk in the paddock is that it was a record attendance and my gosh what weather we had, and with the bar being open it seemed those not driving home made the most of the event.